Jump At The Sun, 9780786852659, 160pp. Epatha knows she's the perfect pick for the lead in the new Sugar Plum ballet. But her dream role isn't as fabulosa as she imagined. When she tries to spice up the choreography with her free-spirited style it's up to the rest of the Sugar Plum Ballerinas to keep Epatha's toes in line. Will Epatha listen to her friends or can she convince the other ballerinas that her way is the best? 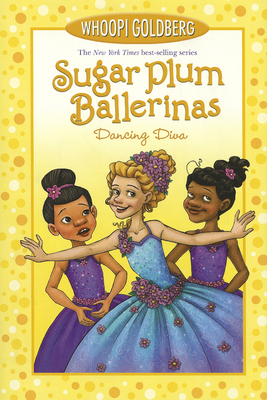 The sixth and final book in the Sugar Plum Ballerina series is as full of fun, mischief, and friendship as ever! Whoopi Goldberg is the author of the Sugar Plum Ballerinas books, as well as Whoopi's Big Book of Manners, illustrated by Olo. She has won a Tony, an Emmy, an Oscar, and a Grammy, as well as two Golden Globes. In 2001, she was awarded the prestigious Mark Twain Prize for American Humor. Whoopi Goldberg has appeared in scores of films and in all media. Visit her and the girls at www.sugarplumballerinas.com. Deborah Underwood's book credits include the Sugar Plum Ballerinas books, as well as Granny Gomez and Jigsaw, illustrated by Scott Magoon, and The Quiet Book and The Loud Book illustrated by Renata Liwska. Her ballet career was cut short by a tragic lack of talent, but she can sing a mean aria and knows four ukulele chords. Visit Deborah online at www.DeborahUnderwoodBooks.com. Maryn Roos was always better at drawing ballerinas than being one. Beyond ballerinas, she has drawn everything from monsters to dancing ducks in dozens of books and several educational software programs, most recently for Imagine Learning English. Maryn lives and draws, and very rarely dances, in Provo, Utah. Find her online at www.marynroos.com.